The Supreme Court of the United States, with “Equal Justice Under Law” etched into the front. While it is easy to dismiss conspiracy theorists, I do not think these are the just the ravings of a madwoman. I think a lot of ardent Trump supporters buy into the idea, promoted by the President himself, that should the GOP lose Congressional majorities in the midterm elections, that those seats would have been “stolen” by some wide ranging conspiracy encompassing traditional media, social media, and China. In an attempt to debunk and educate, lets explore the difference between “stealing elections”, and really stealing elections by devaluing people’s votes. The idea that there is some conspiracy to “steal elections” is utter nonsense which only serves to widen the country’s already massive partisan divide. This is not just my opinion–only 13 of the 24 states’ attorneys generals invited to the Justice Department’s meeting on “social media bias” even bothered to attend. Furthermore, the meeting ended up focusing on privacy concerns on social media, not political bias; when the adults get together they speak about the real issues, not baseless allegations. Allegations like these are part of the Trumpian playbook; get out there early and cry foul, so if an outcome you don’t like comes to pass, you can say “see, I told you it was rigged”. Trump did this throughout his campaign, and it has continued into his Presidency. This is a sad, if unsurprising, abdication of accountability by Trump. It is a childish excuse, commonly employed by those who are unable to accept loss in a dignified manner. You would not (or should not) accept such excuses from your friends on trivial matters, so why would you from elected officials on much more consequential ones? Yes, Twitter made a mistake with its algorithm. Yes, this mistake caused certain profiles to become less accessible by failing to auto-suggest them when a user began a search (they were still returned in search results). Twitter has owned up to this mistake and fixed it. To err is human; when mistakes inevitably do occur, the best course of action is to admit to and rectify them, as Twitter has done. It should be noted that this was a relatively benign mistake that occurred well before the election cycle got into full swing (July, elections in November); it is not something that will impact the outcome of any of the midterm elections. A broader issue, however, is at play here–the delicate balance between free speech, protecting public safety (censoring extremist content and hate speech), and ensuring our democratic process plays out fairly (limiting false information on political issues / candidates, including foreign interference). There is no rule book for finding the “right balance”, as a nation we are learning as we go. Having said that, false political information is an actual threat to the integrity of our elections (as opposed to baseless accusations of bias). If anything social media companies should probably be erring on the side of too much restriction of potentially false information, not too little. Note that false information (or “fake news”, if you must) does not include opinion pieces that present themselves as such, like Normative Narratives, but rather false information being presented as fact. Trying to find the proper limits on free speech is not a new problem, social media is just the latest (and probably most complex) iteration of this ongoing debate. Public safety has always had to be balanced against freedom of speech (“clear and present danger”, you can’t yell “FIRE” in a crowded movie theater)–it is baked into the First Amendment itself. Technological improvements often outpace our elected officials ability to regulate them. This problem is especially prevalent in today’s hyperpartisan political environment, with its resulting legislative gridlock. Taken together, all this means it could take several imperfect attempts in either direction–to much censorship or too little–before we reach that elusive “proper balance”. The reality that it is a long road to reaching this “proper balance” is a feature of democratic governance that we must accept. What we should not accept is the deliberate marginalization of voters that results from political and racial gerrymandering. 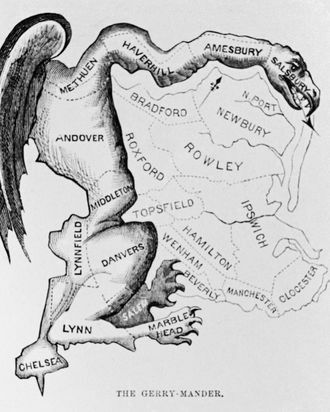 The original “gerrymander” in early 19th-century Massachusetts. The U.S. Supreme Court has ruled that racial gerrymandering is unconstitutional, but has not yet ruled on partisan gerrymandering. Several states, however, have ruled that partisan gerrymandering is also unconstitutional, which should (eventually) force the Supreme Court to come to a definitive ruling at the national level. A U.S. court panel has ruled there is not enough time to recast North Carolina’s congressional maps ahead of the November elections even though it found the Republican-constructed lines were illegally drawn for partisan purposes. “North Carolina will have to suffer again under yet another unconstitutional Republican law that silences voters, divides our state, and undermines our democracy,” Wayne Goodwin, the state’s Democratic Party chairman, said in a statement. The party was a plaintiff in the suit. Republicans in 2016 won 10 of the 13 House districts – 77 percent – despite getting just 53 percent of the statewide vote, nearly the same result as in 2014. The North Carolina dispute centered on a congressional redistricting plan adopted by the Republican-led legislature in 2016 after a court found that Republican lawmakers improperly used race as a factor when redrawing certain U.S. House districts after the 2010 census. First of all, when it comes to the democratic process, there is no “better” party. Policy differences of course exist, but these are secondary to making sure the democratic process plays out as fairly and transparently as possible; any “patriot” that puts party ahead of democracy needs to take a long look in the mirror. Now back to the issue at hand–gerrymandering. In the past decade, North Carolina lawmakers have been found to have illegally drawn voting districts based on both racial and political considerations (in fact they directly and unapologetically replaced their racially unconstitutional map with a politically unconstitutional one). It is hard to argue that there were not some truly stolen elections in North Carolina. Unfortunately this problem is not limited to North Carolina (or the Republican party–Democrats do it too). Which party gerrymandering benefits more really just depends on who the majority is when it comes time to redraw a state’s voting district lines (“redistricting”). It is worth noting that because of demographic trends (liberals tend to live in more concentrated cities), gerrymandering has more potential benefit to the GOP. The larger issue is not which party gerrymandering benefits more, but rather that it should not be a tool to benefit either party. Hopefully changes to the redistricting process (or possibly even more significant changes to how we elect our representatives), in addition to a more definitive U.S. Supreme Court ruling, can eradicate this plague on our democracy. It is, however, certainly an uphill battle. When the democratic process plays out fairly and transparently–two qualifications many elections, including the 2016 Presidential election, do not meet–the means justify the ends. Elections do have consequences, but they should never be predetermined, or even allowed to be titled to one sides favor. All that should matter is the principle of one-person, one-vote. Now the Electoral College purposefully distorts this principle in Presidential elections, but that is another topic for another day. Regardless of your opinion on its current merits, the Electoral College was created intentionally as one of the compromises that birthed our great nation; it is enshrined in the U.S. Constitution until an amendment is passed that says otherwise. Gerrymandering, on the other hand, is a bastardization of America’s democratic process. It is not a stretch to say that our Founding Fathers did not intend for gerrymandering to be a feature of our democratic process. This problem has only become more acute as software is developed to help lawmakers more effectively “pack” and “crack” districts. As with the issue of free speech on social media, technological improvements in gerrymandering have outpaced our government’s ability to regulate it. 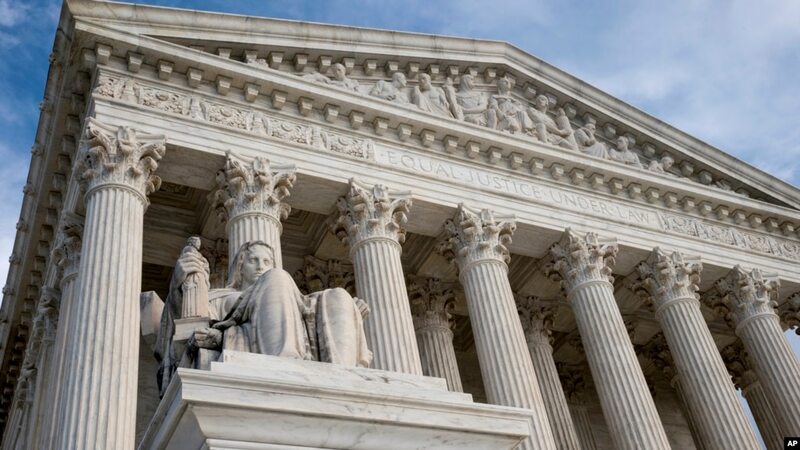 By continuously punting on the issue of partisan gerrymandering, the U.S. Supreme Court has been negligent in upholding the words carved into its facade–“Equal Justice Under the Law”. Categories: Blog Posts, Conflict Watch, Transparency Report | Tags: bias, censorship, electoral college, fake news, free speach, gerrymandering, Social media, supreme court, Trump | Permalink. “It is difficult to comprehend Twitter’s indifference, and its biased and prejudiced stance. We believe that this attitude is damaging to the brand image of the company in question and creates an unfair and inaccurate impression of our country,” the statement from Erdogan’s office said. “We will wipe out all of these,” said Erdogan, who has said the corruption scandal is part of a smear campaign by his political enemies. “The international community can say this, can say that. I don’t care at all. Everyone will see how powerful the Republic of Turkey is,” Erdogan said. It is laughable to call Twitter “biased”, as it is a social media platform for people to share what they think. If Twitter is “biased” against Erdogan’s administration, it is because it has lost the support of the Turkish people. If Twitter was creating fake accounts to post anti-Erdogan tweets, or censoring pro-Erdogan followers, that would indeed be biased; this is not the reality of the situation. On one hand, Erdogan says “Twitter, schmitter”, as if he is indifferent to supposedly falsified accusations against him. On the other hand, he shows himself to be very concerned about what goes up on Twitter, enough so to shut the social media platform down. Erdogan is clearly afraid that Twitter will catalyze a revolution in Turkey, as it did in Egypt. In an attempt to show his strength, Erdogan has instead shown just how concerned he is about his oppositions social media activities, lending credence to their claims. This action is likely to backfire, adding another grievance (alongside corruption, tightening control over the judicial branch, and firing hundreds of police officers and officials) to the opposition’s arsenal, while moving protest movements from social media back to the streets. U.S. first lady Michelle Obama told an audience of college students in the Chinese capital on Saturday that open access to information – especially online – is a universal right. Censorship in Chinese news media and online is widespread, and internet users in the country cannot access information about many controversial topics without special software to circumvent restrictions. Turkey has modernized quickly over the past decades, and currently boasts a much stronger human rights record than China or Egypt. But sometimes taking away freedoms can cause a greater backlash than keeping them from people in the first place. When people have been empowered with certain rights and then see them taken away, it generally does not sit well. It is not easy to take criticism, but as most people know, addressing a claim only makes it appear legitimate. In the age of social media, any position in the public eye requires “tough skin”. While Erdogan has presided over a prosperous era in Turkish history, he now seems outdated and unfit to govern a country with “Western” aspirations (such as EU ascension). Erdogan sounds borderline crazy when he calls dissent a “conspiracy” or “bias” from an inherently neutral medium of expression. c) a legitimate grievance which must be addressed with policy changes. When “c” is met with a dismissal (claims of conspiracy, bias, etc.) and tightening of power, it makes the situation worse. Erdogan still remains very popular in Turkey, but one has to question how many missteps his popularity can endure. Categories: Blog Posts, Conflict Watch | Tags: bias, censorship, China, conspiracy, Egypt, Erdogan, free speech, Human Rights, Michelle Obama, Social media, Turkey, Twitter | Permalink.